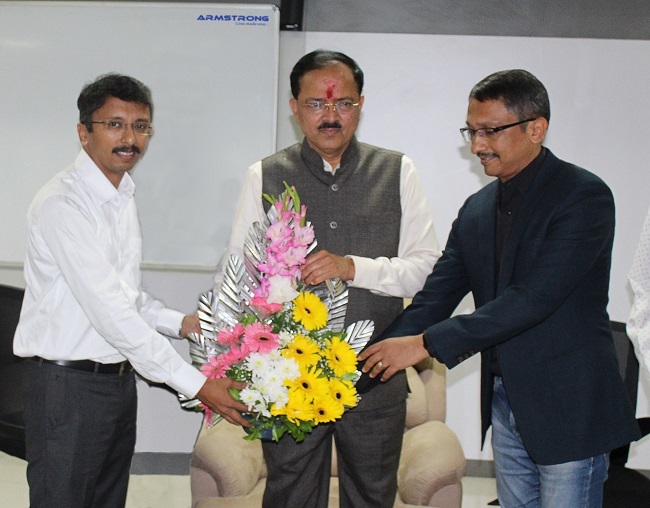 Mr Pranav Majgaonkar, Managing Director (Left), Mr Vineet Majgaonkar, Chairman (Right) welcomes Hon’ble Dr Subhash Bhamre Union Minister of State of Defence (Center) at Armstrong. Hon’ble Dr. Subhash Bhamre, the minister of state for Defence of the Government of India visited Armstrong's factory. He was “stunned” to see the kind of robotics, factory automation and IOT solutions that Armstrong has been developing and deploying globally. During his hour long visit, he curiously dived into every aspect of technology that was explained to him by Mr. Vineet Majgaonkar, the Chairman of Armstrong. “This is one of the most genuine Make in India and Skill India projects that our government intends to happen. I’m stunned and also proud to witness the high skill levels that you have trained these sons-of-the-soil in delivering solutions at par with the world’s best,” were his words after the factory tour. The visit concluded on an exciting note with the high decibel reverberation of patriotic slogans like “Bharat Mata Ki Jai,” and “Vande Mataram,” shot by team Armstrong. Armstrong is a provider of intralogistics automation solutions which are aimed at achieving error free operations, workforce reduction, high space utilization, high visibility of inventory, real time tracking with lowest TCO. We help you change the status quo in your domain with a range of intelligent, fast & high in productivity solutions with a quick ROI of less than two years. Our solution generates data by the second as the machine runs & learns to improve their own performance. Our deep industry knowhow & decades of experience will help you solve most complex problems and zip your cost!